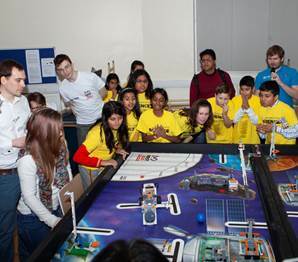 Almost 200 school children from across East Anglia gathered at University of Cambridge’s Department of Engineering this week (Tuesday 15 January) to compete in the IET FIRST® LEGO® League Cambridge regional heat. Team CERC, Cambourne Electronics & Robotics Club, were awarded the FIRST® LEGO® League Champions’ Award and will now progress to the UK and Ireland final, taking place in Bristol on 16 February 2019. FIRST® LEGO® League is a global education initiative for students aged between 9 and 16, where teams of up to ten complete a series of robotics-themed challenges and build and program an autonomous robot, using a LEGO® Mindstorms® kit. Designed to encourage young people to take an interest in real world issues and develop technology skills, the challenge comprises three parts: the Robot Game, the Project, and the Core Values. To compete in the Robot Game, teams programmed autonomous LEGO® MINDSTORMS® robot to complete missions and score points on a themed playing field. Winners of the Robot Game, who scored most points during the missions, were Cambridge, The Pizza Robot. This year’s project assignment saw teams identify and solve a physical or social problem faced by humans during long duration space exploration within our sun’s solar system. Swavesey Science Club from Swavesey Village College took home the Project Award. Throughout the entire FIRST® LEGO® League challenge, teams operate under, and are asked to demonstrate, the FIRST® signature set of Core Values, celebrating discovery, innovation, impact, inclusion, teamwork and fun. This year’s Core Values winners were Shirley Community Primary School, due to their exceptional demonstration of team work, enthusiasm and collaboration through the entire tournament. This year’s Best Newcomer award went to a team that showed outstanding skill and dedication during their first year participating in the tournament – Trinity Titans from Trinity School Sevenoaks. Hosted by the University of Cambridge and supported by Qualcomm Technologies International, Ltd., the IET FIRST® LEGO® League Cambridge regional tournament saw a host of experts from the STEM industry come together judge and mentor students, including representatives from Marshall Aerospace and Defence Group, Arm, Cambridge Science Centre and Mott MacDonald. The tournament also saw maths education extraordinaire, author and TV personality, Bobby Seagull, M.C. the event – opening the tournament, commentating on the Robot Games and, finally, presenting the participants with their trophies, medals and certificates. 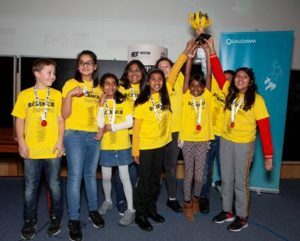 Seema Webb, Director, Human Resources, Qualcomm Technologies International, Ltd., comments: “This year’s IET FIRST® LEGO® League Cambridge tournament has been an absolute smash hit! It has been fantastic to see such incredible levels of enthusiasm, creativity and ingenuity from so many young people in Cambridge. Qualcomm Technologies, Inc and its subsidiary companies support the FIRST® LEGO® League globally, and on a local level this includes extra support to ensure a diverse set of teams from across the county of Cambridgeshire are able to participate. FIRST® LEGO® League, one of four programs offered by FIRST®, is an annual international competition which sees over 320,000 young people (in 40,000 teams), from across 98 countries, come together to develop their STEM skills. The operational partner of the FIRST® LEGO® League in the UK and Ireland is The Institution of Engineering and Technology (IET), the competition is also supported globally by Qualcomm Technologies, Inc. and its subsidiaries, with sponsorship that helps to fund participation.